Auralex Platfoam is an extremely dense, effective isolator and decoupler, when used beneath a riser or floating floor Platfoam dramatically improves isolation characteristics and both minimizes the sound transmission into neighbouring spaces and prevents vibration from those neighbouring spaces entering into your instruments above the Platfoam. Platfoam can be used to construct drum risers and floating floors either permanently or temporarily, making it an available solution to a plethora of situations that require sonic and absorbent isolation. 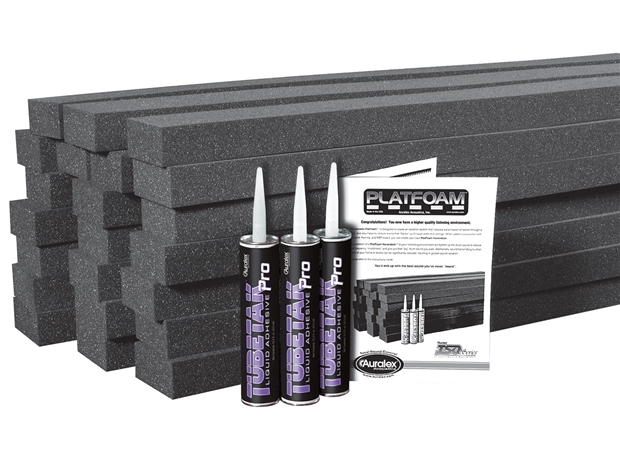 Affordable, easy and quick to apply and pack up and above effective, Platfoam is an incredibly versatile product. Platfoam can also float amp racks. Simply build a slightly smaller drum riser and use several of the leftover Planks to build a mini-riser for bass and guitar cabinets. Auralex offers the GRAMMA v2 Amp Isolation Platform (62/GRAMMA) as a pre-fabricated option. Auralex also offer a purpose built drum riser (62/HOVERDECK) and drum mat (62/HOVERMAT).